Edward Higgins "Ed" White II (November 14, 1930 – January 27, 1967) was an American test pilot and astronaut. He was the first American to take a "spacewalk," leaving the safety of his spaceship while in space and moving around outside in a spacesuit. On June 3, 1965, White flew into space as pilot of Gemini 4. This was the second trip by astronauts in NASA's Project Gemini. White was able to get out of his spaceship in outer space, an activity called a spacewalk, then get back in and come home. (The Soviet Union had already done that earlier in the same year.) The trip lasted until June 7, 1965. 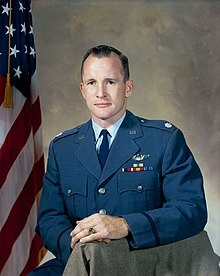 White died along with fellow astronauts Gus Grissom and Roger Chaffee during a test for the Apollo 1 mission at Cape Canaveral Air Force Station (then known as Cape Kennedy), Florida. ↑ "Astronaut Bio: Edward H. White, II". NASA. December 1997. Retrieved July 16, 2015. This page was last changed on 22 November 2017, at 15:55.